You're Invited to Health in the LGBTQ Community: Improving Care and Confronting Discrimination | Fenway Health: Health Care Is A Right, Not A Privilege. You’re Invited to Health in the LGBTQ Community: Improving Care and Confronting Discrimination | Fenway Health: Health Care Is A Right, Not A Privilege. You’re Invited to Health in the LGBTQ Community: Improving Care and Confronting Discrimination – Fenway Health: Health Care Is A Right, Not A Privilege. More than half of lesbian, gay, bisexual, transgender and queer Americans report that they have experienced violence, threats or harassment because of their sexuality or gender identity. Nearly one in five LGBTQ people has avoided seeking medical care for fear of discrimination. To learn how we can help end these health disparities, please join the Harvard T.H. 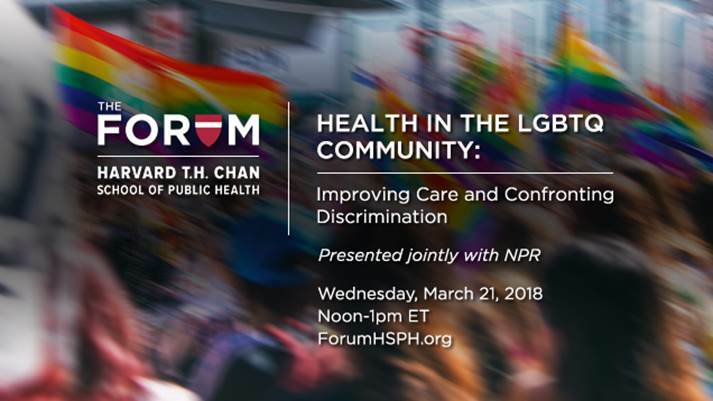 Chan School of Public Health for Health in the LGBTQ Community: Improving Care and Confronting Discrimination, a Forum presented jointly with NPR. The Forum will take place Wednesday, March 21, 2018 from 12:00 PM to 1:00 PM at The Leadership Studio, Kresge 10th Floor, 677 Huntington Avenue, Boston. In this Forum moderated by Joe Neel, NPR’s Deputy Senior Supervising Editor and a Correspondent on the Science Desk, experts in LGBTQ health will explore health disparities and discrimination that impact the LGBTQ community. Drawing from a recent poll by NPR, the Robert Wood Johnson Foundation and the Harvard T.H. Chan School of Public Health, our panel will look at the impact of these experiences on physical and mental wellbeing — and what can be done to help. E-mail questions for the expert participants any time before or during the live webcast to theforum@hsph.harvard.edu. Or Tweet them to @ForumHSPH using #LGBTQ. The Forum will also stream live on Facebook. Join us for a live chat on The Forum’s HEALTH IN THE LGBTQ COMMUNITY web page. The Forum will accommodate as many questions as we can during a limited Q&A. If time does not allow for us to ask your question, we encourage you to continue the conversation by posting comments on our website at ForumHSPH.org.